Like any vegetable, beets contain a wealth of nutrients and important phytochemicals. Beet juice can be considered an essential part of any nutritional juicing program. RediBeets is 100 percent beet juice powder and provides you with the benefits of red beet juice without the time and expense of juicing. Great for maintaining overall health! What do beets provide us? One cup of raw beets is high in carbohydrates and low in fat. It contains phosphorus, sodium, magnesium, calcium, iron, and potassium, as well as fiber, vitamins A and C, niacin, folic acid, and biotin. Although these are not found in U.S. "Recommended Daily Allowance" (RDA) quantities, we must remember that nutrients derived from natural sources may be "better" than those found in supplements, as they are found in an organic form. When these nutrients are captured in a juicing process, they remain in a form that is much easier to assimilate than synthetic nutrients. The iron in beet juice, in particular, is noted for being much more easily assimilated than man-made forms of iron. The half pound of beets used to make a teaspoon of AIM RediBeets? is residue-free, and the beets are processed in a state-of-the-art facility that separates the juice-and its valuable nutrients-from the plants' fiber. In this process, the beets are not subjected to high temperatures that may damage their nutrients. As part of a regular juicing program, AIM RediBeets? offers a convenient way to make juicing a part of your daily diet and meet the National Cancer Institute's recommendation to eat five servings of vegetables a day. How to use AIM RediBeets? Take 1 tsp (4 g) 2 times per day. Mix with water, juice, or other members of the AIM Garden Trio?. Or, take 6 caplets 1 time per day. You may use more or less depending on your needs. Drink AIM RediBeets? immediately after mixing it. AIM RediBeets? is best taken on an empty stomach: 30 minutes before or 2 hours after a meal. 75 F; 20.1-23.8 C). Do not refrigerate. You may take AIM RediBeets? with other AIM products, except AIM Herbal Fiberblend?. Take Herbal Fiberblend? 1 hour before or 30 minutes after taking RediBeets?. Can I mix RediBeets? with other AIM products? Yes. Many people enjoy taking RediBeets? mixed with BarleyLife (or Barleygreen?) and Just Carrots ?. Some mix a half teaspoon with the Herbal Fiberblend ? to improve tast. Taking the Herbal Fiberblend ? 1 hour before or 30 minutes after taking RediBeets? will insure best absorbtion of the beet juice . Is it OK to take more than the recommended serving? Each person has different nutritional needs, which should be assessed by each individual. However, beet juice can have a strong effect on some individuals when they incorporate it into their diets for the first time. For this reason, it is suggested that people take the recommended amount at first and increase gradually. RediBeets? tastes quite sweet when I drink it. I am concerned about sugar. Is there a lot of sugar in RediBeets?? There is no processed sugar in RediBeets?. 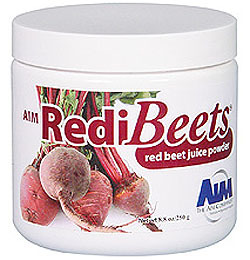 In fact, the only ingredient in AIM RediBeets? is beet juice. However, beets produce natural sugars, which is what gives AIM RediBeets? its sweet, natural taste. What part of the beet is used to make RediBeets?? RediBeets? is made from red beets, which is the type of beet that is typically served at the dinner table. Only the root of the beet is used to make RediBeets? powder. How many beets make one pound of RediBeets?? It takes approximately 25 pounds of beets to Make one pound of RediBeets?. See Current uses of beets, Juicing, and Phytochemicals and Suggested Reading for more information. Whole body health results when all body systems are in balance. No single body system is targeted-we make choices that keep all systems toxin-free and that supply all systems with optimum nutrition. The result is total wellness: waking up every day feeling great! RediBeets? helps provide the daily nutrition you need to develop a strong foundation for your good health. RediBeets? is a Whole Body Health product. The complete Whole Body Health lines consists of the Garden Trio?, BarleyLife?, Just Carrots?, RediBeets?, and Herbal Fiberblend?. Use these products to give yourself a solid foundation for your health.